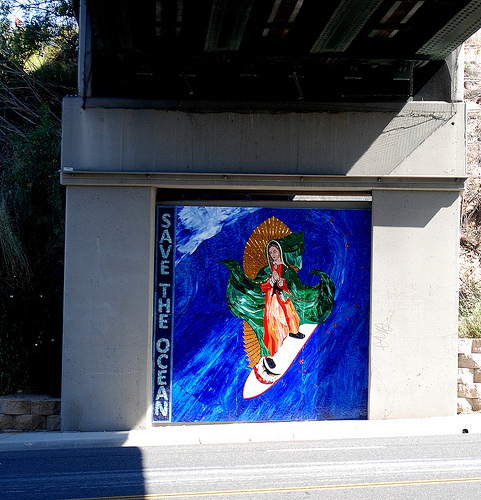 * Photo – The Surfing Madonna is a 10 by 10 foot (3 by 3 m) mosaic of the Virgen de Guadalupe created by artist Mark Patterson. It was covertly installed in Encinitas, California. It was a hot May afternoon, and I was sitting in my last college class of my senior year at the University of California at Davis. Our professor had walked us through all the permutations of urban economics. I’d finished the examinations, written my last blue book, and was, like my fellow students, expecting a fairly low-key final lecture. And indeed it started off that way. Then our professor surprised us. And he then proceeded to unveil a vision of an economy based on selfless interest, based on giving and sharing, based on mutual love and concern for one’s fellow beings. This was not your typical textbook lecture. It also was quite different from the “from each according to his ability, to each according to his need” concept of Marxism. It seemed to me the professor was talking about something different. Something spiritually centered and based on the Golden Rule. Some students snickered. Many of us squirmed a little in our seats. But the professor persisted. And he made me think about economics in a completely new way. For me, it was the best lecture of the year. Now I don’t know what that professor’s spiritual convictions were, or if he ever realized how much of an impact he made that May afternoon so long ago. But I won’t forget it. it was the best lecture of the year. As I look back now, it brings to mind two different Bible stories. First is the story from First Chronicles that tells how people gave joyfully and willingly to fund the building of the Temple of Solomon in Jerusalem. King David said, “Who am I, and what is my people, that we should be able to offer so willingly after this sort? for all things come of thee, and of thine own have we given thee” (29:14). The fundamental recognition that all the good we have has its source in God moves us forward. When we give of that goodness, we are really sharing what God has blessed us with. God gives us of His goodness without measure. As Psalm 23 says, “My cup runneth over.” All the good we ever see, experience, or embody is God’s to begin with. God gives it to us, expresses it through us, so that we, as His children, can share it with each other. This is basic to understanding the economics of Love. And it is illustrated beautifully in the next story. A man who was well versed with the law approached Jesus and quizzed him on what it meant to “love your neighbor as yourself.” So Jesus told him a story about a traveler who fell victim to violence. Jesus told of two “righteous” people who could have helped, but instead chose not to. Then a Samaritan—someone considered an outcast, “unrighteous,” at the time—came along. And he actually “got his hands dirty,” and went down to where the traveler was, patched him up, and helped him to a safe place, where he paid for the traveler’s care. The Samaritan helped him well beyond just what was necessary. You could say he went the extra mile (see Luke 10:25–37). Jesus then asked the legal expert which of the passersby seemed to him to be the true neighbor to the traveler.“ ‘The man who gave him practical sympathy,’ he replied. ‘Then you go and give the same,’ returned Jesus” (Luke 10:37, J. B. Phillips). Jesus was making a vital point about the economics of Love: God gives us all the love we have ever known, felt, or expressed. Just as King David acknowledged all the rich goodness he and his people were happily giving belonged to God, we can rejoice that when we give love by sharing it with others, we are reflecting the Love that is God. It’s not personally ours. The Bible says, “We love him, because he first loved us” (I John 4:19). And Jesus said: “Thou shalt love the Lord thy God with all thy heart, and with all thy soul, and with all thy strength, and with all thy mind; and thy neighbour as thyself” (Luke 10:27). These are the two greatest commandments, and they should encompass everything we say or do. Mary Baker Eddy follows up on this thought by saying this: “Giving does not impoverish us in the service of our Maker, neither does withholding enrich us” (Science and Health, p. 79). I knew this all was true theoretically, but, as it so often is, I had to learn the reality of it the hard way. At one point, I had spent years living and working in a care facility for the developmentally disabled. While it was rewarding in lots of ways, it was also both physically and emotionally very demanding. So much so that I’d finally had enough, and I resigned. This effectively left me both jobless and without a home. Fortunately, a friend let me share his place and chip in for rent while I got things sorted out. And as a construction foreman, he also helped me get odd jobs here and there. That was a real gift. And so while I did the odd construction clean-up job, I also applied for job after job and sent out my résumé everywhere I could find something even remotely relevant in the want ads. I didn’t get one single response. Not one. It wasn’t all that long before I burned through my hard-won savings. I actually got to the point where I was living off the vegetables in the garden I’d planted (thankfully!). But it just kept getting worse. I still had a roof over my head, thanks to my friend, but I could tell I was wearing out my welcome—especially since he was about to get married. I’d have to go somewhere else. But where? One particular day I was really feeling desperate. The construction work had dried up, so I didn’t have any quick prospects of generating income. There I was, a college-educated guy, sitting there at the kitchen table with a third notice to pay my phone bill. My portion of the rent was due, and all I had was $6—a five and four quarters. I felt like such a loser. In tears, I reached out to God. I really reached out. I didn’t know what else to do. I just prayed: “Father, please show me, please, please, just show me what to do.” And then the oddest thought came to me: “Give gratitude.” Huh? But yes, no matter what else was going on, I could always give God gratitude. I was always free to be grateful. I could always count my blessings, count the ways God loves me, and give God gratitude for all that I already did have. And so right there at that kitchen table, I started by giving gratitude for the phone company. What a blessing their service is! I thought. How wonderful it is to be able to call anyone anywhere in the world because of all the hard work all the phone company people do to make it happen. How easy they make it to just pick up a phone and call next door or across the country or even to other countries. And all because of their silent unseen hard work that’s blessing me and everyone else who has a phone. And then it flashed on me that the phone bill was not something evil or harsh—it was a symbol of all that care and hard work and, yes, even love that many people had poured into their jobs every day. In fact, the phone company’s “bill” was actually an opportunity for me to thank them. And to thank them in a very tangible way by sending them their well-earned payment. I was bound and determined right then and there to pay them—monetarily as well as with heartfelt gratitude. In fact, I realized I could be grateful for every single bill that ever showed up because those bills would give me a chance to be grateful and express that gratitude tangibly by paying companies for all that they do. It’s an opportunity to share love tangibly for all those services I was enjoying. It’s an opportunity to participate in the economy of Love. Right then, there was a knock at the door. It was our landlord. And he wondered if he could hire me to paint his house. Well, yes, of course, I said; I’d be glad to paint his house! And that was the beginning of the turnaround for me. I still had challenges, and it took me almost another nine months before I landed a full-time job. But I have never again suffered from poverty. This experience taught me that God will answer our prayers no matter what our difficult circumstances. The Bible says: “And we have known and believed the love that God hath to us. God is love; and he that dwelleth in love dwelleth in God, and God in him” (I John 4:16). And Science and Health states,“Divine Love always has met and always will meet every human need” (p. 494). There is an “economy of Love.” Divine Love meets your human needs, not by changing something inherent about you but by awakening you to share love, live love, and give it as naturally as God does. We can always turn to God, divine Love, to discover the Love that is the source of our very being. Yes, God actually is Love. And we are made in His image and likeness. We are made to reflect His love, to naturally give it back as well as to pay it forward. Every day He opens ways for us to live His love out loud. That kind of sharing has nothing to do with a bank account. But it does have everything to do with living love in your heart with sincere gratitude. There is a lot of substance to this article. Great job! Such a beautiful thing this daily bread is that gets posted regularly.